My room is constantly messy – I can’t seem to keep it clean. Help! I totally have the same problem as you do – whether it’s my room or my office, I just can’t seem to keep the clutter away! Luckily, I’ve learned some tricks on how to clean up fast – and, most of the time, keep it that way. I hope some of these tips will work for your messy bedroom! Since it seems like you’ve decided that you can’t stand the mess anymore, it’s time to do something about it. The best way to tackle any messy space is to do it bit by bit – and to try and have some fun at the same time! My fave way to clean is to blast my fave CD or radio station while I’m doing it. Somehow, singing along to my favorite tunes makes the chore seem less tedious (and yes, I do use the broom handle as a mic from time to time!). Like I said before, the best way to clean your room is to do it one step at a time. I find it’s easiest to concentrate on one area of my room at a time, and not to stop until that space is clean. You might want to start with the stuff on your floor, or the papers on your desk. While you’re going through your things, divide them into three piles: one for putting away, one for throwing away and one for giving away. 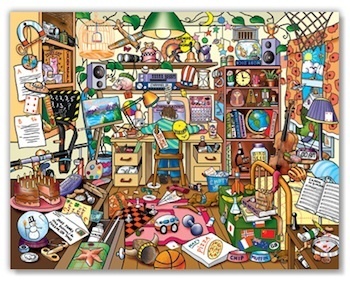 The last two piles are especially important – the less stuff you have, the less messy your room can get in the future. If it just seems like too much work to do on your own, ask your BFF or your brother to help you out – and promise to do the same for them next week. And don’t forget to reward yourselves after you’ve finished cleaning your room – go get some ice cream or go see a movie. You deserve it! Has this ever happened to you? Got any good advice for Irish821? Leave your comment below!